Scott #'s 620 & 621. Back flap printed return address to association. Scott # 582. Open at left. Scott # 584. Open at left. Scott # 585. 1/4" tear at right edge. Torn flap. Scott # 619. Unopened & clean. 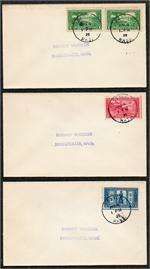 1925 Lexington Concord Issue - Uncacheted Set/3. #5 Envelopes. Addressed. BOSTON MA FDOI 4.4.1925. Scott #617-619. Scott #'s 617-619. Clean #5 envelope. Year date off edge. To Klein. Scott #'s 617-619. #5 envelope open at left.